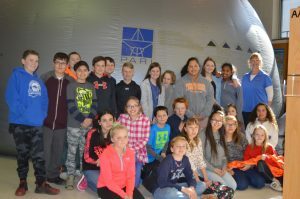 Waynesville Middle School hosted a mobile field trip from the Pisgah Astronomical Research Institute located in Rosman, NC. 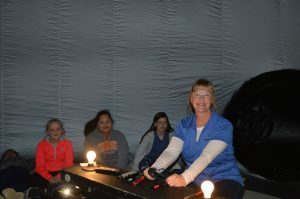 The staff educator, Nonnie Cullifer, brought a mobile planetarium for the entire 6th grade. Students enjoyed a presentation on planets, eclipses, constellations, moon phases, and how to locate items in the night sky. She also gave students an in depth history lesson on how the constellations and planets were named from Greek and Roman mythology. These lessons are part of the North Carolina essential standards for 6th grade science and social studies. Students experienced these phenomenon inside a dome lying on their backs while going on the adventure in a simulated spaceship. Waynesville Middle School student Christina Green said, “The mobile planetarium was amazing!” Another student Brooke Wright said, “I learned how to find my way out of the woods using a constellation.” Jordyn Parton said, “I liked learning how the constellations and stars form shapes that are Greek gods and goddesses and seeing the planets up close.” The Institute offers onsite activities such as meteorite exhibits, planetarium shows, and mineral exhibits. Check their website pari.edu for more information.